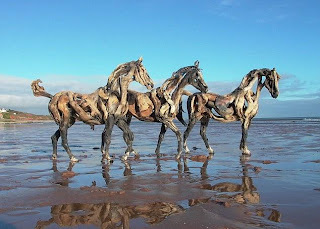 Frozen in a series of dynamic life-like poses, these beautiful horse sculptures are even more incredible because each one of them is made almost entirely from driftwood found on the beach. 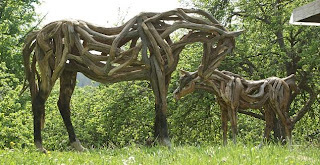 Created by noted West Country artist Heather Jansch, the driftwood horses have become much sought after amongst equine enthusiasts, with some trading at almost £55,000. 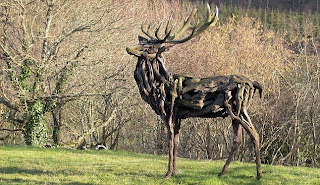 Painstakingly created, each sculpture which can take Ms Jansch, 60, up to three years to create is totally different and unique. 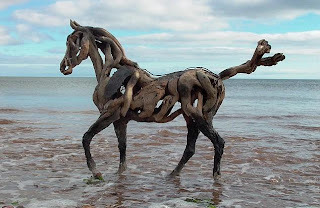 Each three quarter-of-a-ton driftwood horse is heavy enough to be self-supporting, despite the fact that they appear extremely light at first glance. 'The structure must not only be strong enough to withstand public display, it must also be able to withstand heavy winds without falling over,' said Ms Jansch. 'The larger sculptures require a steel frame. This is first painted with a rust inhibitor and then coated with fibreglass to give a roughened surface. Each horse she builds usually stands around 17 hands tall (five and half feet), but it is the life-like qualities that are most impressive. 'I really couldn't tell you why people find my horses so alluring. I think it is something to do with the dynamic aspect of my horses. 'I have seen people become deeply affected by my work and that makes me pleased,' said Ms Jansch, who is based in the small Devon hamlet of Olchard. 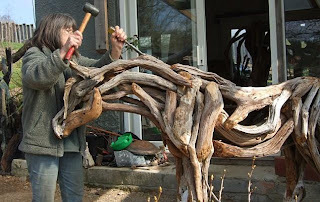 Originally working in fine art paintings, Ms Jansch started driftwood sculpting in the 1970's almost by accident. 'I was tired of following in other peoples footsteps. I had been working with copper wire and the sculptures were like Da Vinci's line drawings but lacked the power I wanted. 'One day I while I was out my son could not find any kindling wood to light the wood-burner and had chopped up a piece of ivy that had grown round a fencing stake, he had left behind a short section that I immediately saw as a horses torso of the right size to fit straight into the copper wire piece I was working on. 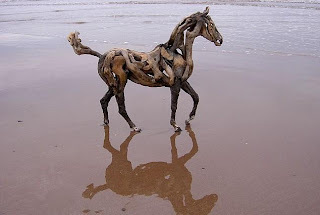 Working on several horse sculptures a year, Ms Jansch usually aims to produce two a year for her customers. Her work has become so popular that now she has a waiting list of three years. Ms Jansch has been making changes to her usual sculpture methods, with her works starting at £15,000. Having now created almost 100 horses in the 30 years since she started, Ms Jansch still keeps her love of horses true to her art. 'I don't generally like to build anything other than thoroughbred race horses. 'I mean for example, Shetland Ponies are fat and uninteresting compared to a raging stallion. Ms Jansch's horses have even been displayed at the Eden Project in Cornwall, but most of her equine masterpieces remain in private collections.